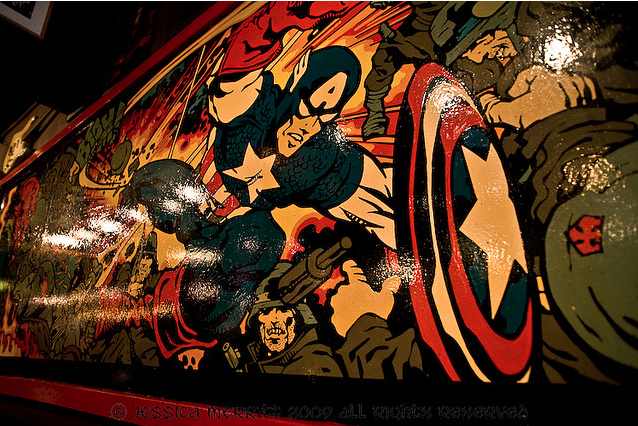 Jim Fitzpatrick murals in Captain Americas | Come Here To Me! 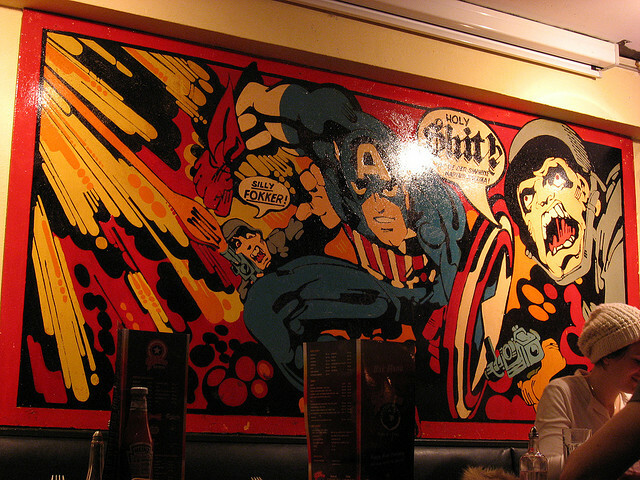 Renowned artist Jim Fitzpatrick has at least two huge pop art murals in Captain Americas burger joint on Grafton Street. The Dublin institution first opened its doors in 1971 and the murals were painted in 1982. I’ve fond memories of being brought here when I was kid. Myself and Dfallon recently availed of a Living Social voucher (buy €60 worth of food & drink for €30). It was my first time eating there in years. The food was lovely, service was great but if hadn’t of had a voucher, I don’t really think we’d have considered it as it remains an expensive place. Capt A’s was always that bit more expensive than the competition. It was to filter the punters a bit … they were looking for South-siders who were hip. Great place to work (I was a floor manager there in the early seventies) with a very 60’s style of management (“Let’s all have a jar after work so that no one notices that you’re doing 60 hours-a-week instead of 40”) and legendary Christmas parties. Never quite the same after the BIG FIRE in 1978 when it was re-built in lounge-bar style and they got a liquor licence. I remover going there plenty ofttimes when I was younger. Took the wife there when I came back with her from Korea for the first time, more for my own sake than for hers, and we had a similar experience minus the voucher. The point is I could hardly sit still looking at the walls with all the memorabilia and murals. Nostalgia to beat the band! Yes, Jim was renowned for his graphics rather than his orthographics .. but he was also a very good soccer player. I remember playing with him many a times in Herbert Park with the likes of Pat O’Faoláin, Bernard and Ger Griffin, Kevin Rockett and the legendary goalkeeper, Wolfgang Keller. I imagine that the original murals which Mr Chalker saw in the seventies were victims of the Big Fire. RIP. Thanks for the informative comments Simon. on January 2, 2014 at 1:14 pm | Reply Advertisements from the 1983 Dublin Theatre Festival Guide | Come here to me!